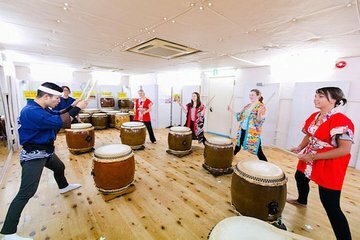 Experience the infectious rhythm and mighty roar of ‘taiko’ (a Japanese drumming style) during this 1-hour class in Osaka. Under the instruction of your guide, you’ll learn about taiko’s history and master basic drumming techniques before showing off your new-found skills with a group performance of a traditional Japanese song. Suitable for all ages and abilities, this small-group experience is limited to 15 participants. At either 10am, 2pm, or 4pm, make your own way to Taiko Center Osaka, located on 3-1-24 Nakatsu. On arrival, you’ll greet your guide, grab a pair of sticks, and prepare to master the basic techniques of taiko — a Japanese musical expression that dates back centuries. Learn about the origins of taiko and the construction of the drums. Under the instruction of your guide, you’ll practice different techniques and eventually perform a traditional Japanese song as a group. Your tour concludes at the Taiko Center Osaka after one hour. it was a fantastic taiko experience. we had a difficult time locating the studio but with help, we manage to find it. the staff were so understanding of our being late, and proceeded to conduct the class. thank you to Taiko lab for a memorable time.